For those like me who just can't get enough Metal Gear, Konami are hard at work on a fully fledged Metal Gear Online, which looks to be a lot more fun than the FOB (Forward Operating Base) missions we've had access to so far. Read on as we give you our thoughts and the official word on when to expect this free add-on (you heard me right - free). Now, I put a lot of time into MGS4's version of Metal Gear Online and did quite enjoy it, but I felt it could have been so much more than it was. Games got repetitive fairly fast and there was something about it that just felt empty to me. Hopefully this won't be the case again with Metal Gear Online, but judging from the trailer, it looks like MGO has a lot more going for it. To begin with we have three Classes - Scout, Enforcer and Infiltrator. Scout as you may have guessed is your ranged character. They like to see what's going on from a distance and deal with their problems from afar. A favoured Class for Snipers no doubt. Next up we have Enforcer. These guys are the ones in heavy armour who can take a good beating while dishing out even more pain. Expect to be blown away with rockets or torn apart with Light Machine Guns when facing these mighty opponents. Lastly we have the Infiltrator. Infiltrators are the ones with the heaviest focus on stealth, having access to the more traditional Metal Gear stealth camouflage you'll be familiar with in the main campaign of MGSV and are said to move around the level faster than the other two classes above. These are the guys who'll get in and out fast. Additionally, there are three mission types to choose from that we know of so far. We have Bounty Hunter which gives both teams the same amount of tickets at the start of the match, decreasing only when someone is killed or Fulton'd. If you kill an enemy your team gains one point while the enemy loses one point. If you Fulton extract an enemy, you gain their ticket points and the opposing team loses them, quickly shifting the balance of the game. Cloak and Dagger - This looks to be similar to your standard Capture The Flag game type. Your objective as the attacker is to recover a Data Disk before uploading it to an Evac point. You have to do this under a time limit, attackers have access to non-lethal weapons only, while defenders have access to lethal weapons only and when you die that's it. You either make it through the round or die, re-spawning on the next. Comm Control - This mode works similarly to King of the Hill game types, where your team need to make it to certain spots on the map to capture comm links in order to retrieve intel. If the attackers successfully capture all Comm Links they win. If the defenders prevent this, they win. In order to capture intel you simply need to just hang around and defend the area until the intel has been downloaded, moving onto the next location once achieved to repeat the same process again. I'm fairly certain these won't be the only game modes available, but the three mentioned above are likely to be the first three included for when Metal Gear Online goes live. Honestly though, I'd be a little disappointed if we didn't have a mode titled "Hide and Snake", where one person plays Snake and everyone else has to find him. It'd be silly, but I'm sure there'd be lots of fun to be had. In addition, it's uncertain whether this applies to every match and game type, but if you press R3 you can salute an ally and if they salute you back this then forms a buddy link, allowing you to see where they are on the map, with locations of each enemy revealed as your buddy spots them. You can also deactivate your buddy link at any given moment, re-establishing it with any other ally on the battlefield as often as you please. This seems like a good way to encourage teamwork and allows for you to better plan your next actions. My Avatar for MGO. Look out for my badass old man online! Metal Gear Online also gives you two options in relation to who you can play as. 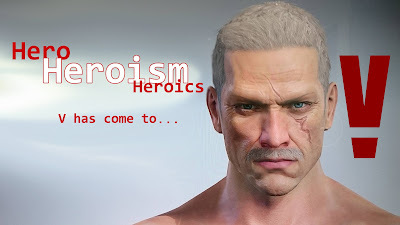 The first of which allows you to play as the Avatar you created at the very start of Metal Gear Solid V's campaign, where as the second option is to create a brand new character/Avatar for your Metal Gear Online experience. Those of you who've completed the main story for MGSV will realise the significance behind this and I personally feel this is a nice touch as it really puts meaning and history behind the character you'll be playing as. As a result of this, multiple characters will be available to choose between, though I just hope the customisation will be deep, with unlockable content left, right and centre. If you could unlock a beret, an eyepatch, aviators, scarves or anything like that then I'd be happy. 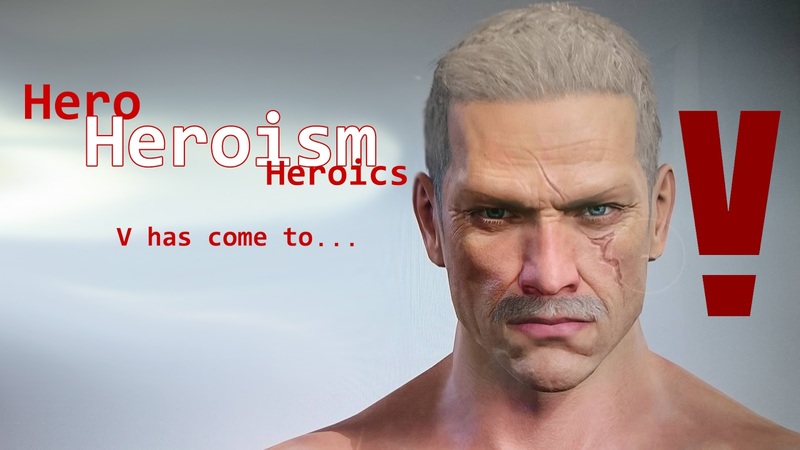 I'd just love to see enough rewards/customisation to give each character their own unique identities and feel this would give more incentive to keep playing MGO, as it would simultaneously greaten the experience and increase replayability. The last aspect I'd like to touch upon is the Unique Character option. 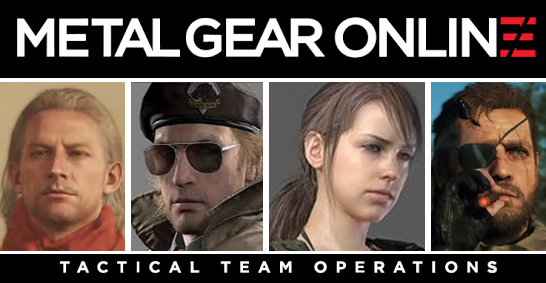 When selected, one player in each team has access to play one randomly chosen unique character from Metal Gear Solid V's storyline. As of this moment we know Ocelot and Snake (Big Boss) will be featured here, although it wouldn't be too much of a stretch to expect to see quiet either. 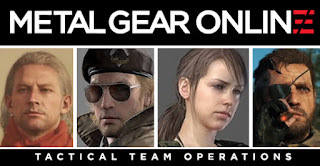 Each of these characters have their own unique abilities, with Ocelot able to ricochet shots with his dual wielded handguns (just like in MGS3) and Snake able to use his Rocket Arm. At this time it's uncertain as to how the game will decide who gets to play these unique characters, but if it's not randomly generated I'd guess it's based on points gained each round after the first (which is likely randomly generated). Regardless, I'll be subscribing to PS Plus just to play this and will be hosting some Metal Gear Online Fun Nights once everything is up and running, so be sure to keep tabs on our Facebook page below for updates, as it'll give you the chance to play with us here at WKG on a regular basis. Metal Gear Online releases October 6th (that's tomorrow for those of you reading at the time this article was written) and just to reiterate, will be a free update to all those who purchased Metal Gear Solid V.